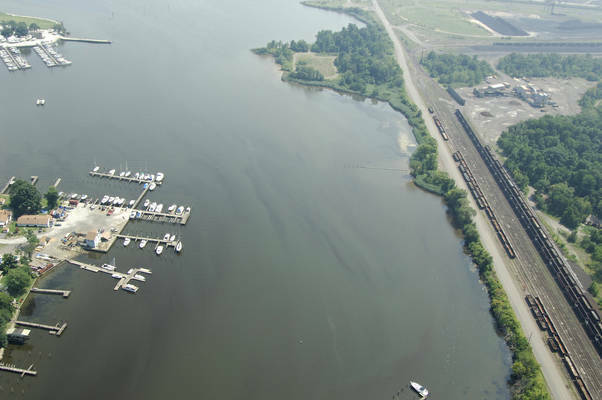 Jones Creek is located at the head of Old Road Bay, which is on the north shore of the Patapsco River about 3.5 miles from its mouth. 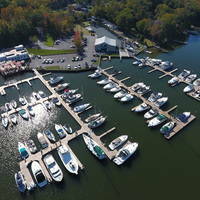 Although not necessarily a destination location, Jones Creek has a couple of excellent marinas, but most notably, a couple of well-equipped repair yards. If you are running late when running up the Patapsco, this is a place to try and layover for the evening, and then make the trip up the Patapsco in the morning. 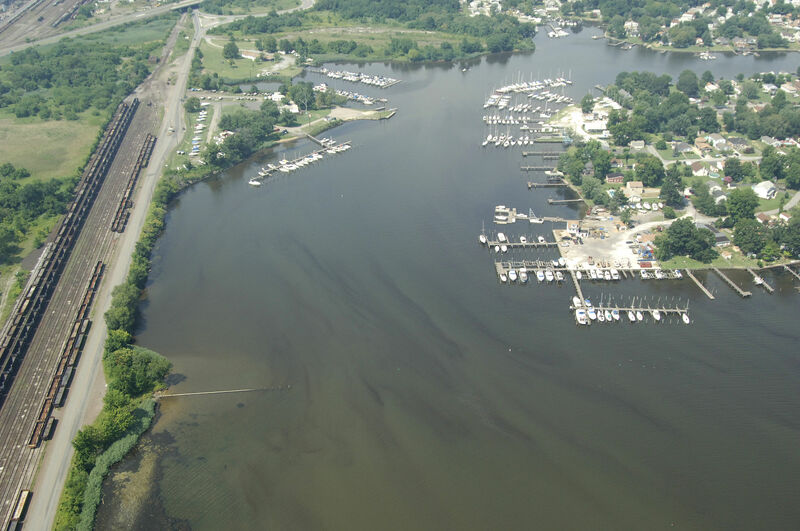 Make sure you call ahead to the area marinas for slip availability before you arrival. The image above is a view from the south looking north over the entrance to Jones Creek. To the left are the large rail supply lines that bring in coal to the Bethlehem Steel plant at Sparrows Point. This entire section of land is charted as the Patapsco River Neck. 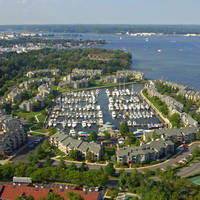 The first marina off to the left (west) is the North Point Yacht Club, while farther up Jones Creek in the small protected cove is the Weber Marina. 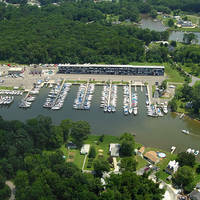 Youngs Boat Yard is the second facility up the creek on the right (east) and another facility with repair facilities can be seen on the right near the creek entrance. The approach to Jones Creek from the Patapsco River and Old Road Bay is fairly simple and straightforward. The only word of caution is that average depths of Jones Creek and Old Road Bay are around four to five feet - plan ahead according to your boats draft. 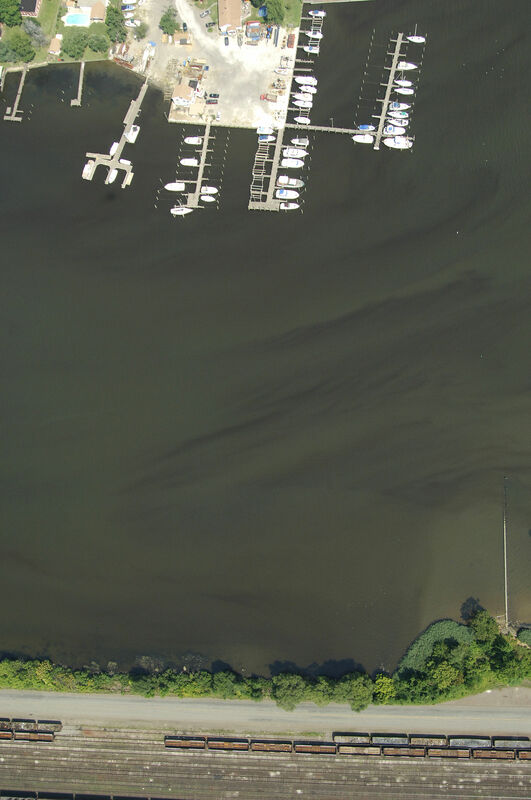 Jones Creek is reached by an approach from the south via the Patapsco River and Old Road Bay. Arriving in the Patapsco River, first set a course for flashing red buoy 6 about a half-mile west of North Point Shoal. Once you have picked up flashing red buoy 6, make a turn to the north and proceed about a mile to pickup flashing red 2 in the middle of the mouth of Old Road Bay. From flashing red 2,head farther north along the Penwood Channel (to the west), which has a series of red nun buoys that surround the outline of this ship unloading channel. If you stay just outside (east) of this channel, it will keep you in water with adequate depths. The north end of the Penwood Channel is marked with red nun buoy 14. From here you can make a straight shot north to green daybeacon 1 at the mouth to Jones Creek, but be sure to clear the mark well to its right; a shoal runs south from here. No reviews yet! Be the first to write a review of Jones Creek Inlet.